Did you really think just because he was barred from a courtroom for a year that Jimmy McGill/Saul Goodman (Bob Odenkirk) was going to stop being a criminal lawyer? Then clearly you’ve never watched an episode of Better Call Saul. In Better Call Saul’s fourth season, Chuck’s death catalyzes Jimmy McGill’s (Odenkirk) transformation into Saul Goodman. In the wake of his loss, Jimmy takes steps into the criminal world that will put his future as a lawyer – and his relationship with Kim (Rhea Seehorn) – in jeopardy. Chuck’s (Michael McKean) death deeply affects former colleagues Howard (Patrick Fabian) and Kim as well, putting the two of them once again on opposite sides of a battle sparked by the Brothers McGill. 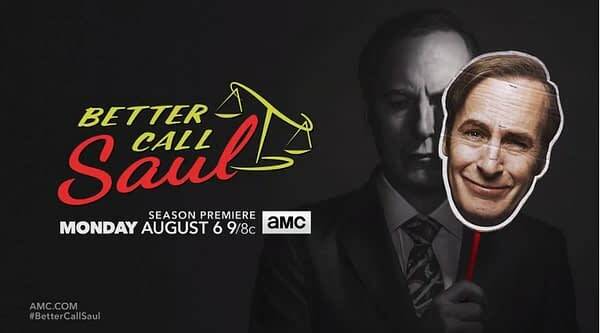 Better Call Saul returns to AMC for its fourth season on August 6th at 9 p.m. ET. A Masterclass with Better Call Saul: Take a deep dive into the Emmy Award and Golden Globe-nominated series with the creative team behind Better Call Saul as we approach the new season that follows the twists and turns of Jimmy McGill’s devolution toward Breaking Bad anti-hero Saul Goodman.